Hunter Tremayne, author of Future Shock 28 ‘The Juggernaut’ was kind enough to answer some emailed questions about his experiences working for the early Tharg and how his story came to print. His generous answers give illumination into the early days of the comic, the comic-shop scene in 1970s london and where a particularly stuffy Base Commander from Dan Dare came from. Q) What age were you when your story, The Juggernaut, appeared in 2000AD and what sort of exposure had you had to comics at that time? A) As I am an actor as well as a playwright, I like to keep the date of my birth a secret! But I was a teenager. I read a lot of comics as a boy, but mainly American ones. Make Mine Marvel! 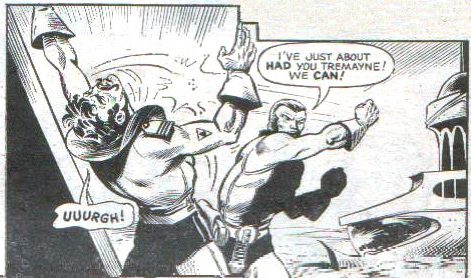 How did the submission to 2000AD come about? I was working at the London sci-fi bookstore ‘Dark They Were & Golden-Eyed‘. Also working there from time to time was Steve Moore, who was writing Dan Dare for 2000AD (he wrote a character called “Tremayne” into Dan Dare, who socked me on the jaw for talking too much – I was a bit of a chatterbox as a teenager!) I had written several articles for British comics fandom, mainly Martin Lock’s BEM, and when I expressed an interest in writing a Future Shock, Steve Moore put me in touch with Kelvin Gosnell. Did you have much contact with either the Editorial Staff or the artist Garry Leach? The way “The Juggernaut” was published was unusual. What happened is that Garry Leach and I were friends, and when I told him that I was planning to write a story for 2000AD (I hadn’t yet rang up Kelvin Gosnell) we went down the pub and came up with the idea for the story. Then Garry drew and inked and lettered it all up, I called Kelvin Gosnell and the following day Garry and I showed up with “The Juggernaut.” Kelvin was expecting story ideas and art samples, but here we were with a Future Shock that was ready to run, so that’s what they did! The only change they made was to turn the Russians into “Volgans”, which was a bit daft as the tank had a huge hammer and sickle on the side! How did you feel about the published piece at the time – do you still hold a copy of the prog in which it appeared? Pretty chipper as I was published at my first attempt! I no longer have a copy, though: I lost almost all of my writing and published work in a fire in 1991. Did you read 2000AD before or after your Future Shock? If you lost interest in it was there a reason why? When I went to Kings Reach tower with Garry the office was filled with middle-aged men bashing away at typewriters. I was a teenager and decided that this wasn’t something I wanted to do for a living. And writing for children’s comics was never appealing to me. You’re credited with working on Graphixus ‘The Adult Comix Showcase’ around the same time, what can you tell us about that and did you do any other comics work? Well, Mal Burns published Graphixus and we were big friends, so I did some stuff for him. I wrote quite a lot of other stuff, actually. I wrote some “When They Were Young” scripts for Look and Learn. I wrote a girl’s serial story for Bunty. The best of it was for an adult anthology comic called Pssst, for whom I wrote a ton of stuff. ! I think the last comics work I did was for an issue of Load Runner. Did you submit other Future Shocks that never made it to print? Do you still read any comics or keep a passing interest in the medium? No. In 1986 I was involved in a comics project called Bordeline (which is how Neil Gaiman met Dave McKean) and when that crashed and burned it broke my heart, and I never wrote another script or read another comic until Alan Moore’s League of Extraordinary Gentlemen. I read the sequel to that, too. They were great fun, but by the third Alan had vanished up his own rear end, so I gave up halfway through. You’ve written several plays and novels since your 2000AD script, what can you tell us about them? Well, as for the novels, “Archangels” was published in 1996 and is still out of print. “In Fear and Dread” is a novelization of a screenplay I sold to 20th Century-Fox and is still available from Amazon as a POD book, though the British edition has some enormous typesetting errors that still haven’t been fixed. My latest short story “The Dealer In Strange & Diverse Curiosities” will be published in BIG MAGIC 2: SOUVENIR this Christmas. I have principally been involved as a writer with the New York theatre. I am a playwright, actor and director. My proudest achievement is VERMILION WINE, my tribute to great noir movies like THE BIG SLEEP and OUT OF THE PAST. It has had two runs in New York, and I will be directing a production of it next spring in Barcelona, where I currently live. This September and October the Riereta theater in Barcelona will be presenting SIX IN THE CITY, six of my one-act plays. I am directing three of them and acting in two. .Is there a central theme or interest that has characterised your work? Unrequited love and the Orpheus myth. .Do you have any websites or ways for people to keep up to date on your current work? Many thanks from Futureshockd to Mr Tremayne for his time and generous answers,. If you enjoyed Hunter’s interview and work be sure to check his forthcoming productions.